the dam snackbar. ha hah ha aww memories i rememb er when iwas reading this in the book and cracked up lol. HD Wallpaper and background images in the The Heroes of Olympus club tagged: the heroes of olympus percy jackson annabeth heroes thalia grover zoe. Haha! Wow, this is pretty cool! THATS MY MOST FAVORATE QUOTE NOT KIDDING!! right? its on my fanfiction.net account!! hahahah!! thats my favorite of all!! Oh my gosh this is one of my favorite moments in the entire series! I was laughing SO HARD everyone around me looked funny at me. It was worth it though. @tribute13 i did the same thing at school and they thoght i was crazy (u shuld have seen there faces PRICELESS!) wich mae me laugh harder! HAHAHA!!! *out of breath* hahahah!! i was in class when i was reading that part and i cracked up..i was laughing so hard!!! everyone looked at me...the teacher told me to go out in the hall to tell her what was so funny..it turned out that she read the POJ books!!! she started laughing to!!!! favurite part of all! I read this over and over and over......(you get the point, im getting dizzy!) so much my parents wondered what it was so they read it. I read it in class and the teacher called my name and I laughed so hard i was crying! lol Pereus54322 you are so right! That was one of my fav parts! i agree one of the best things in the whole dam series! hahahahaha i remember laughin at this! OMG! I laughed so hard at this part. I was in tears xD Ah... brings back the memories. And not that I don't LOVE HOO (I sware I do) but their just not as funny as PJO. But I still love them. And Leo helps. i could laugh at that all day! that never gets old! i love that one i also like the one whem anabeth is trying to spell cyclops but cant!!!!!!!!!!!! (What if there was a dam arrow shop! 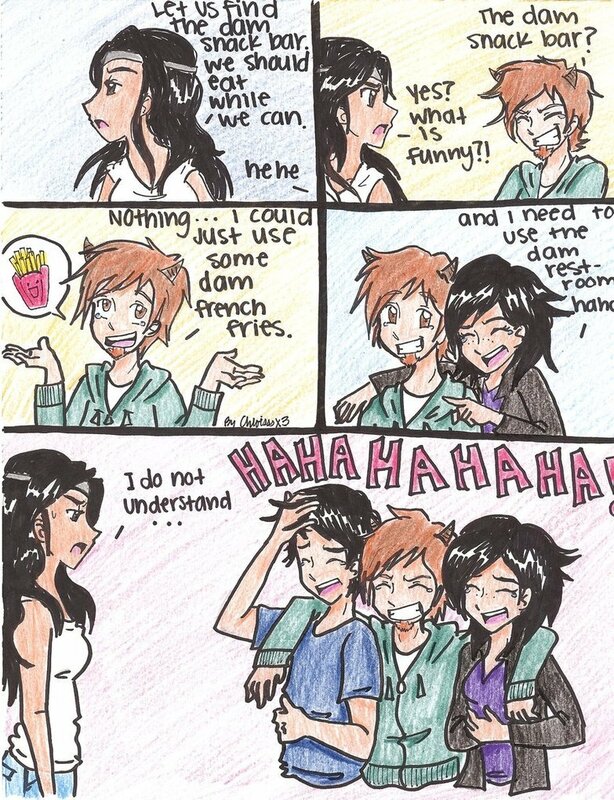 Everyone else: PWHAHAHAHA DAM CHOCOLATES DAM FRIES and zoe is just like: Uhh...whats so funny?? ?